Home » Blog » Life is Like a Box of Chocolate Christmas Gift Baskets! Create sweet memories this Christmas with chocolate Christmas gift baskets for everyone on your list! As I take a break from my chocolate candy making experience today, the smell of rich, mouthwatering chocolate fills my home. Maybe I’m getting a little bit sentimental as the Christmas holiday draws near, but I think I’m falling in love with chocolate! There is a lot to be said for this exquisite holiday treat and it’s interesting to know why chocolate Christmas gift baskets have made their way to the list of favorite traditional gifts. Throughout history, chocolate has played a role in religious events like Christmas. It is perhaps one of the most precious edible gifts that can be received. Priests used to present cocoa beans as offerings to the gods, and various cocoa beverages were frequently served during sacred ceremonies. What Type of Chocolate Lover is on your List? It is believed that the type of personality people have has a huge impact of the types of chocolate they prefer. If you’re planning on giving chocolate Christmas gift baskets this year, you might want to read on! The kid at heart will typically prefer sweet milk chocolate treats. Problem solvers enjoy deep, dark chocolate varieties. Authoritative individuals seek out treats that contain bittersweet chocolate. The peacekeeper in your life will appreciate white chocolate. That social butterfly tends to just love chocolate in general! An assortment of chocolates in various forms packed neatly in a festive basket is a chocolate lovers dream! Gourmet chocolate combined with other holiday sweets are sure to satisfy anyone’s sweet tooth! Chocolate and wine combinations are marvelous gifts for the wine fanatic in your life! There is just something about the sweet flavor of chocolate mixed with a hearty wine that makes the mouth water! Sweet and salty, chocolate gift baskets that combine the succulent taste of chocolate with a variety of salty gourmet treats and nuts will surely tantalize those taste buds! No matter what type of chocolate lovers you have on your list this Christmas, or how large or small your budget, there is something out there for everyone when it comes to chocolate Christmas gift baskets! Chocolate Christmas gift baskets make excellent and well appreciated gifts for almost anyone on your shopping list. Unless, of course, they just don’t like chocolate- (gasp)! Youngsters will appreciate gift baskets that contain chocolates that are cheerfully wrapped in bright colors and designs, and maybe include a small toy or stuffed friend to cuddle with. That special lady in your life will adore a thoughtful chocolate gift basket that includes wine, cocoa, or other complimentary treats. Look for elegant presentations that impress. Men will enjoy large chocolate gift baskets that are filled to the brim with a variety of chocolates and other assorted treats. A more masculine presentation might be appropriate. 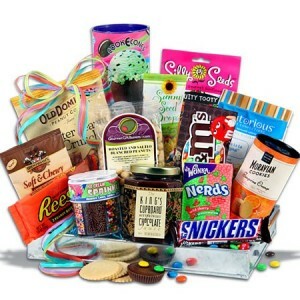 Older folks enjoy chocolate gift baskets that contain varieties that are easy to chew and not too rich. 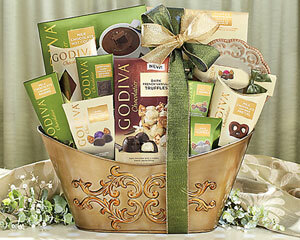 Consider chocolate gift baskets that also contain gourmet coffees, teas, or fruits.